The final addition to this piece was another glaze of French Ultramarine Blue (mixed to a coffee-like consistency) used on the flower head an the darkest value shadows. 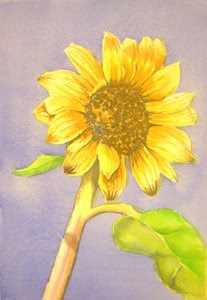 And here is the finished sunflower. This technique of building a painting in glazes is fun. It is great for those who think their paintings look to light or thin. It's a great exercise for those who paint too heavy (with thick, opaque pigments), to practice using more water and to allow the different colors to build value and life into your work! If you would like to paint along with any of these lessons, you can order the photo reference and drawing online at http://watercolorgirl.etsy.com, just click on the icon for the online class.